Is there a difference between feeling scared to death and scared to life? What is the church doing wrong if its children mistake the Holy Spirit for a monster? In a few days, all manner of scary critters will come to my door, threatening mischief if I don’t provide snacks. My house is popular on Halloween – on a downtown side street along with a dozen others whose porch lights will welcome the scary horde. This yearly visitation is one of the reasons I love my home. The usual assortment will come: babies in strollers, toddlers holding orange jack-o-lanterns in one hand and their parents’ hands in another, batches of elementary schoolers, and the random teen with a pillowcase and a latex zombie mask. No one looks like they usually do, and many have spent hours covering themselves in masks and make-up. Some will even have bloody fingernails and warts. One and all will leave with Twix bars or Nerds. The next day, everyone will be in their usual clothes with their usual faces – scary no longer. This season makes me wonder what kind of masks we wear every day, hiding our everyday selves, trying to look fierce, asking for what we want with a threat to encourage its granting. Many years ago, I took my young sons Trick-or-Treating. I would take them to the houses with the outside lights on and skip those that weren’t, following the traditional Halloween rules and teaching them to my children. Everything went as it usually does on Halloween – candy and costumes, laughs and glow-in-the-dark bracelets – until we got to the white house with the wrought iron fence. Lights were on, inside and out, so we went up to the door and rang the bell. No one came. After a minute, my son rang the bell again. “I can hear it ringing,” he said, but no one came. “Try knocking,” I said. No one came. After another minute, we walked away. “That’s not fair. They have their lights on,” my other son said. For several Halloweens after, my sons would talk about the rule breakers in the white house; oddly enough, they never said a word about the lights off houses. It was the rule breaking that bothered them, not missing out on treats. The lights off/lights on Halloween house rule is a great way to know who wants costumed children at the door and who doesn’t. Most people abide by this rule because it’s practical and convenient, not because it has moral weight or importance. Breaking with custom or habit may make things awkward, but unless real harm is intended or inflicted, there is no need to harbor resentment. I suspect the same can be said for many of the social rules I hold dear. When my sons came home from school today (high school and middle school), I brought up that Halloween incident. It took them a few moments to remember it, and they moved on to another topic within a minute. No negative comments, no judgment, and no interest in past sins. They had moved on. When a social rule I value is disregarded, especially when no harm has come, I hope I can do the same. 1. The speaker really feels it is his or her place to say. 2. They are usually followed by a negative assessment of someone or something – and often the someone or something isn’t around to reply. For some reason, casting aspersions on someone else’s character or actions sounds a little less petty when couched in humility, false or not. But gossip is gossip, and making negative comments about someone else often says as much about the speaker as it does the hapless subject. If I take them to heart, they have the power to do more than stop me from spreading gossip: they can keep my mind from even thinking about it. A few days back, my sister and I sat at her kitchen table catching up over snacks and a glass of wine. I’m at home there – not my home, but a home that welcomes me. I feel like I belong there, even if I don’t live most of my life there. My sister’s kitchen isn’t set up the way mine is. Sharp knives sit in a block next to the stove, just below her plates and bowls and just above her silverware. Drinking glasses and coffee mugs live near the sink. Containers for lunch away from home are gathered together on the other side of the sink. Her table is between the hutch and the sliding door overlooking the back yard and deck. Things in her kitchen are in place for a reason, and their placement makes her life easier and more interesting. My coffee mugs and wine glasses live together in the same cupboard. My dishes and water glasses are on open shelves between the dishwasher and fridge. Knives and silverware are to the left of the sink. Cooking utensils are in the silver cylinder next to the stove and hot pads. My dining table is in another room. These things are in place for a reason, and their placement makes my life easier and more interesting. For me, Everything in its place isn’t a generic phrase or state of reality: it’s specific to tangible places and unique individuals. It’s different in my home than in my sister’s, and different still in the homes of friends and strangers. I can prepare a meal in my sister’s house and she can do the same in mine. There’s a bit more hunting around for the vegetable peeler and the frying pans take some getting used to, but convenience by itself isn’t the goal. In the grand scheme of things, it isn’t even that important. When everyone sitting at the table feels at home, when each person belongs there, then everything is truly in its place. God bless this kitchen and all enter it. Amen. …except in canning season. There are seven jars of green tomato relish, four more with pickled beans, and eleven filled with applesauce. There are three more in the fridge – one of each already opened and tasted. Next week a dozen cranberry sauces will join the heavenly tasting host. Most of these are only here for a couple of months; they will depart in Thanksgiving baskets and Christmas boxes to take up space in the cupboards and iceboxes of friends and family. But for now, they are guests in and on my shelves, tables, countertops, and bookcases. My canning equipment is on the dishwasher, adding to the overcrowding. This year’s hot peppers are in bowls with the few remaining green tomatoes. I’ve made a dining table centerpiece of squash because they are beautiful – and I have no room in the kitchen for them. Herbs in jars have broken out of the spice drawer, claiming space next to the drinking glasses. They, too, will be gone over the holidays as tandoori rubs and cajun spice mixes. My house runneth over with the bounty of garden, bog, and orchard. My home is just the right size for me and my family to live interesting lives. There is enough room for guests to feel at home, but they sleep on a sofa bed. The kitchen is a good size for a 1950’s Cape, but there’s no walk-in pantry. I have enough shelf space for the canned goods we will keep, the dried herbs we will use, and the usual grocery items needed for two weeks of meals. I wouldn’t trade home for a bigger one, but it’s an adventure in inventive storage and display right now. It’s a good thing I like the look of squash and mason jars. I don’t want a larger-than-life place or life. It’s too much work to go too big, and the world is better for me staying at my current size. 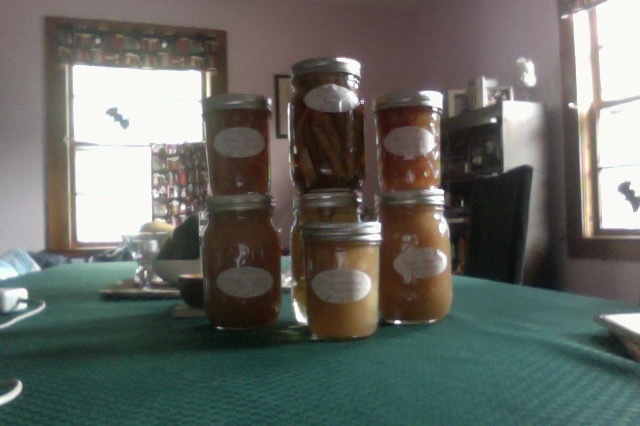 The jars that I can’t fit in place are meant to go elsewhere; I’m meant to give them away. I trust in the bounty of next year’s harvest, and the steadfast presence of God that holds me in love. There is a place for everything in my house…and if it doesn’t fit, then it’s not my everything to keep. There were twenty three of us in Advanced Biology that afternoon for Mr. Chamberlain’s famous water displacement contest/experiment. A couple of hoses, graduated test tubes, and water were all set. The directions were simple: blow into the hose attached to the tube filled with water. Breath becomes air pressure, moving the water into the second tube – water displacement via lung power. The experiment part: measure how much water is displaced by each person and figure out the class average. The contest: try to displace more water than everyone else. The prize: bragging rights and a spot on Mr. Chamberlain’s ongoing chart of winners. Before we began, Mr. Chamberlain had everyone guess who would displace the most water. To a person, we picked Andy. He was well over six feet tall, played football, and was on the cross country ski team. After that, we picked skiers, long distance runners, and tennis players. Following them, the rest of us. With our predictions set, each of us took our turn moving water with breath. As predicted, Andy displaced more water than anyone else. The male skiers and runners displaced around the same amount on their tries, clumping around third place. Then came the female athletes. The remaining students were spread out below that. But second place, between Andy and the male athletes, was mine. Five foot two inches, one hundred and fifteen pounds, and able to displace more water than everyone but Andy. It was such a surprising result that Mr. Chamberlain had me do the experiment twice. When the result was the same, he added me to the chart of winners (small letters, with my height, weight, gender, and second place status noted). I doubt I had a lot more lung capacity than my classmates, but I did spend a lot of time in Chalk Pond. Swimming underwater taught me how to control my breathing. I knew how much air was in my lungs and how far I could swim on a single breath. I was aware that I had reserves of oxygen I usually didn’t need or notice. Perhaps I displaced more water because I knew just how much air I had in reserve, and what I could do with it; perhaps my classmates didn’t. I think the same is true with my spiritual life. There are reserves that I barely notice and rarely call upon. They are there, ready to displace sadness, grief, anger, and fear. Even better, these spiritual reserves don’t end with my own strength and stamina: they are renewed by the one who gives life and breath to the whole universe.